*** Please note that this document is for reference only and is considered by the farmer before practicing outdoors. Free flying is a complex issue that requires the knowledge of the parrot to be very high. Do not encourage uninitiated people to fly freely by flying freely with great risk that the Parrot may fly away even today’s leading trainers. But they limit the risk to the lowest level. With good training specialists, the risky situation is very good. Many of you have been raising parrots even when they grow parrots. But when grown up they are not as docile as we would like, some individuals may even return to bite the farmer, even though you have tried the best care possible for it. What you did wrong here is that your care is not right. First, I have to tell you the difference between “feeding as fully as possible” and “feeding on science.” In fact, you are trying to meet the nutritional needs of the parrots by making a variety of dishes for them to fill up bowls of food so that the parrot does not get hungry … It is because of that that is lost. the connection between you and the pet. The parrot does not depend on you. Through these facilities I built a more scientific way of feeding and still secured the growth of the parrot’s body and simultaneously stimulated their intelligent movement. I divided my food into 2 meals a day (1-8 am, 2-6 pm). The amount of food they consumed during the day was about 20% of their body weight. The amount of food can change a little depending on what food it is that the calories in that little or more that adjust to increase or decrease a little food. I would give a 1/3 cup of breakfast (supper should be vegetables, fruits, bulbs, high fiber foods) and dinner would be a meal that would be 2/3 (food It is recommended to feed grain, starchy foods and oils. When I give advice about food management, some people are mistaken about starving a bird so that the bird can hear you. Actually, the nature of the two issues is to increase the focus of the parrot’s training, but the two issues are completely different. It is before training people or starving them to be more obedient. This is a negative way for people to control the parrot in a matter of moments. 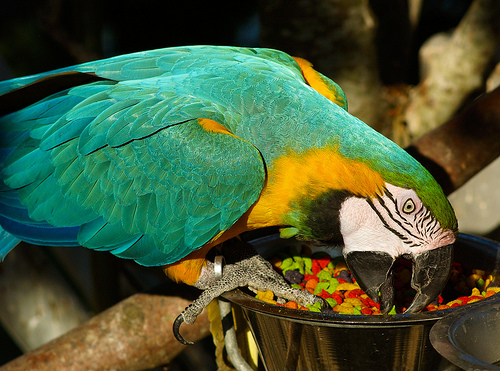 The meal is divided into two clear and fixed meals so that the parrot is not starved to eat one-two-day meals as if the dog or cat is in the house. When meal and time are fixed, the body of the parrot, the digestive organs regulate the enzyme digestion, based on a recurring biological cycle schedule. For example, with the average weight of gray parrots giving them the freedom to eat 4.5g – 5.5g so my ideal weight here is that I can manage them at 4.5g or a little lower. So they will listen to you when you train and still maintain good health for the bird. Before half-an-hour meal we take parrots to eat as a reward for training. Dress for the Parrot flying between you and strangers to enhance your social life. The parrot will not fear strangers and will not fly when you meet strangers. 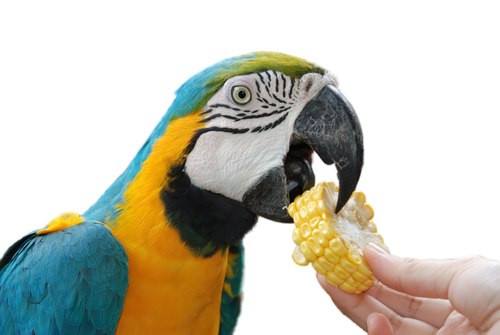 -You can train some parrots for training and rewards that will help you to have a better relationship with the Parrots. – Play with them always feel comfortable for them. -The children like to play with colorful toys. – Some of your actions that make them angry should know that they do not like and need to be taboo. Avoid that and continue teasing them will be bad impression on you. After you have mastered and completed all of the above, is it time for you to ask the question? Well, to be able to release the freedom without risk, before you master the above processes, you need to check that their behavior is safe enough to release the strings. For example, I had a gray parrot after completing the steps I started tracking and counting the number of times I dropped the guarded rope and the area in my yard would drop the rope at the level if the bird flies in In the yard, the rope tied. Passing the patio area will be stretched. So when the parrot is not strained, then the parrot flies to meet the requirements and I count it as a successful flight. continue the same day the next line not stretched I counted as 2 times successful fly. continue to count so successful flight times 3, successful flight times 4, ……. But once you have tied the strings in successive times, you will begin to recalculate from the unsuccessful level so keep checking so until 50 successive “successful” drops you can take off. freehand rope 50 times flying parrots in control, then surely 51 times (the first unleash – the first free flight) will also be in control. Post-trasses still interleave with the release of several strings in the freezes, which can then be dropped completely while flying. – When the fly free fly successfully, but want to bring to another place. You do not need to recalculate 50 successes but just count the 10 successful times that you can untie!